"The employees of all cooperative sugar mills in the state would get the medical allowance of Rs 250 against Rs 125 per month being paid to them at present". This was announced by the Haryana Chief Minister, Mr Bhupinder Singh Hooda, while addressing a rally at the premises of Shahabad Sugar Mills, 30 km from here, today. S.S. Surjewala, president, Kisan Khet Mazdoor Congress cell, expressed concern over suicides by a large number of farmers in various parts of the country. The Haryana Government has prepared a scheme to popularise secondary education on the pattern of the Sarv Shiksha Abhiyan. The scheme will be implemented after getting clearance from the Centre. As a part of the new education policy in various schools being run by educational societies, institutions and trusts in the district, the Haryana Urban Development Authority has directed the proprietors of these institution to reserve 10 per cent of the total seats for students belonging to the weaker sections of society. School owners charge money to arrange copying! Former Punjab Chief Minister Parkash Singh Badal will inaugurate the OPD wing of Meeri-Peeri Medical College at Shahabad (Markanda), 30 km from here, on April 26. Navneet Kaur of Assandh will be honoured for her courage during a state-level function on Women Empowerment to be held in Karnal tomorrow. She took the courageous step of refusing to marry a boy of Nilokheri two months ago as he had demanded Honda City car from her family in dowry. The District Town and Country Planning Officer, Ms Gurmeet Kaur, has levelled charges against the Congress MP from Karnal, Dr Arvind Sharma, for allegedly threatening her for carrying out the demolition of unauthorised structures. Haryana Chief Minister Bhupinder Singh Hooda today said construction of the Dadupur-Nalwi Canal would be completed in three years. Ambala Cantt MLA D.K. Bansal today handed over a demand letter pertaining to issues that need to be addressed by Haryana Chief Minister Bhupinder Singh Hooda. "The employees of all cooperative sugar mills in the state would get the medical allowance of Rs 250 against Rs 125 per month being paid to them at present". This was announced by the Haryana Chief Minister, Mr Bhupinder Singh Hooda, while addressing a rally at the premises of Shahabad Sugar Mills, 30 km from here, today. 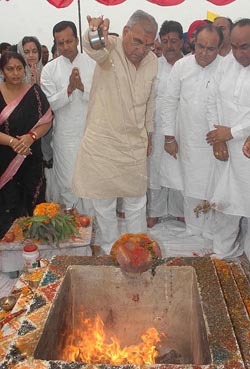 After performing "bhumi pujan" of Dadupur Shahabad Nalvi canal to be constructed at a cost of Rs 267 crore, Mr Hooda said that the Congress had made a promise in its manifesto during the last Vidhan Sabha elections that the canal would be constructed. The promise would be fulfilled shortly. With the construction of the canal, the low water level in this area would come up. He alleged that with a view to take political mileage, the then Haryana Chief Minister, Mr Om Parkash Chautala, laid the foundation stone of the canal in November, 2004 but no budget provision was made for its construction. The Chief Minister said that the Congress was committed to the welfare of every section of the society. The floor rate for land acquisition had been increased. Equal distribution of irrigation water would be ensured and all areas would get their legitimate share. The government had given the compensation of Rs. 40 crore for the acquisition of land for the canal. He announced that it would be completed within the next three years. He asserted that sufficient funds would be made available for the development of all areas without any discrimination. Haryana was the first state in the country to implement the decision that no farmer or labourer would be arrested for the recovery of cooperative loans in the state. The maximum sugarcane price at the rate of Rs. 135 per quintal had been given to the farmers. Besides, relief had been given to the people belonging to Scheduled Castes and backward classes by waving Rs. 1600 crore worth of power bills. A number of concessions had also been given to traders and employees, he claimed. The Irrigation and Revenue Minister, Captain Ajay Singh, said that with the construction of this canal 223 villages of three districts would be beneficiaries and it would irrigate 92532 acres of land. During the current financial year a sum of Rs. 35 crore had been earmarked for the canal while three dams would also be constructed on the Ghaggar. The Haryana Pradesh Congress Committee (HPCC), Working President, Dr. Ram Prakash, said the government was giving special attention to development of all areas. Kurukshetra MP, Mr. Naveen Jindal, demanded that Shahabad town should be made a sub-division so that people could get facilities. The Shahabad M.L.A. and organiser of the rally, Mr K.L. Sharma, said that 50 per cent budget had been earmarked for the welfare of poor people of the society. The Education Minister, Mr Phool Chand Mullana, Haryana Tourism Minister for State, Mrs. Kiran Choudhary, and Cooperation Minister of State, Mrs. Meena Mandal. Addressing a press conference here yesterday, he said farmers were forced to commit suicides mainly due to poverty or being debt-ridden and there seemed to be no end to this tendency. He urged the Centre and state governments to take immediate steps to improve the economic condition of the farmers and demanded that a package for the farmers should be announced. He welcomed the announcement by the Union Agriculture Minister, Mr Sharad Pawar, at Hyderabad recently to provide a financial package for the farmers of Maharashtra, Karnataka, Kerala, Andhra and some other states but demanded that Punjab, Haryana and other states should also be brought under this package . Surjewala said when the NDA government was in power at the Centre, the economic condition of the farmers deteriorated. Though then Prime Minister Atal Bihari Vajpayee and Finance Minister Jaswant Singh made announcements to make policies for farmers, but nothing concrete was done in this direction. Surjewala appreciated the steps taken by the present UPA government for increasing substantially the budget for agriculture. He said but some concrete steps should be taken if the government was serious to help the farmers . The farmers should be provided loans at the rate of 5 or 6 per cent by the banks so that they did not fall prey to moneylenders and commission agents as some of them charged very high rate of interest. He demanded that the private moneylenders and other agencies advancing loans to the farmers should be registered. Agricultural inputs like diesel, power, seeds , fertilisers and pesticides should be made available to the farmers at the reasonable rates and their quality should be regularly checked so that farmers do not suffer losses . The cost of agriculture produce sold by farmers in the market should be linked to the price of agriculture inputs . The Haryana Government has prepared a scheme to popularise secondary education on the pattern of the Sarv Shiksha Abhiyan (SSA). The scheme will be implemented after getting clearance from the Centre. This was stated by the Deputy Chairman of the state Planning Commission, Mr Ranjit Singh, while talking to newsmen at his residence here today. He said to popularise secondary education, a campaign would be launched on the pattern of Sarv Shiksha Abhiyan. Under this, the state government would provide various educational facilities to the plus-two students free of cost. Mr Ranjit Singh revealed that the state government had started an ambitious “Student Security Insurance” scheme. All students of government schools would get an insurance cover under the scheme. Its premium would be paid by the state government, he added. He maintained that remedial coaching was also being introduced in the government high and senior secondary schools across the state. Under the scheme, extra classes in English, science and mathematics would be arranged for X and XII standard students for six months. The teachers would get extra remuneration of Rs 500 per month. Mr Ranjit Singh asserted that the education was being made job-oriented, adding that no educated youth would remain unemployed in future. “ The state government has demanded an amount of Rs 435 crore from the Centre to establish a model school in every block of the state,” he disclosed. Desks and benches would be provided in all government schools this year, he said, adding that additional funds were being provided for the purchase of laboratory equipment. As a part of the new education policy in various schools being run by educational societies, institutions and trusts in the district, the Haryana Urban Development Authority (HUDA) has directed the proprietors of these institution to reserve 10 per cent of the total seats for students belonging to the weaker sections of society. As per the policy the schools have been directed to charge the same fee by such students as is being charged by the government schools. Moreover, 10 per cent seats have been kept reserved for these students on the basis of merit. To ensure the implementation of the policy effectively a committee has been constituted under the chairmanship of the Deputy Commissioner of Panchkula. The members of the committee, include Additional Deputy Commissioner, Panchkula, Estate Officer, HUDA, Member Secretary, City Magistrate and District Education Officer. One member each from the district administration, the estate office and the HUDA would also be a part of the management of these schools. The first meeting of the committee was held today under the chairmanship of Mr Brijinder Singh, the Deputy Commissioner of Panchkula. In the meeting it was decided that notices would be issued to all educational institutions that have been allotted land by the HUDA, Panchkula, asking them to submit the information in a performa. The estate office, HUDA Panchkula, would issue notices to such schools asking them to furnish details in this context within 15 days. Stating this at a press conference held on the premises of Gurdwara Chhevi Paatshahi here on Saturday, the Shiromani Gurdwara Parbandhak Committee (SGPC) vice-president, Mr Raghujeet Singh Virk, said on the same day Mr Badal would lay the foundation stone of the extension block of the college. He said Rs 9 crore had already been spent on the construction of Rs 100-crore project of the college, which would spread over 26.5 acres. Mr Virk said the SGPC had also approved a grant of Rs 2.5 crore for the construction of a school at Tarlokewala in Sirsa district, another in Kaithal district and a music school at Sheikhupura village in Karnal district. The schools would be affiliated to the Central Board of School Education (CBSE). District-level seminars in connection with the 400th martyrdom day of Guru Arjan Dev would be organised at five places — Karnal, Kurukshetra, Yamunanagar, Ambala and Sirsa — before June 16. In reply to a question, Mr Virk alleged that the Haryana Shiromani Gurdwara Parbandhak Committee (HSGPC) ad hoc members’ demand of the formation of a separate gurdwara parbandhak committee for gurdwaras in Haryana was not justified. The SGPC had already been providing funds to complete its projects in Haryana. The SGPC had earmarked Rs 95 lakh in the annual budget for the propagation of Sikhism in Haryana. Whereas the yearly income from seven gurdwaras under the control of the SGPC in Haryana was Rs 90 lakh. He alleged that the HSGPC members were misleading people by demanding a separate gurdwara parbandhak committee for Haryana Sikhs. Navneet, M.Phil from Punjabi University, Patiala, took this bold step just a day before her scheduled marriage when she had come to know that her would-be husband was a dowry-hungry man. Besides these courageous women, 32 women of the district will also be honoured for their outstanding work for the upliftment of females. The District Town and Country Planning Officer (DTP), Ms Gurmeet Kaur, has levelled charges against the Congress MP from Karnal, Dr Arvind Sharma, for allegedly threatening her for carrying out the demolition of unauthorised structures. The DTP had given her complaint against Dr Sharma in writing on April 12 to the Deputy Commissioner and the Director, Town and Country Planning, but no action has been taken yet. Confirming the complaint, the Deputy commissioner, Mr D. P. S. Nagal, said the matter had been conveyed to the higher authorities. He said directions were awaited from the government. Dr Sharma could not be contacted despite repeated attempts. The Tribune had highlighted the alleged racket of shady land deals in a news report on April 10. On April 9, the DTP had carried out a demolition drive in which relatives of certain Congress leaders were allegedly involved. As many as 12 shops, two upcoming residential colonies and a couple of factories falling under the proposed urbanisation zone of the town were pulled down. Meanwhile, the DTP had written to the Deputy Commissioner that on April 10, Dr Sharma had allegedly threatened her over the phone and "ordered" her to stop the demolition drive. The MP had allegedly dared her to take action against local Congress workers. The MP had also allegedly threatened the SDM, Mr R. K. Singh, for launching a demolition drive, the complaint said. Mr Hooda said the canal would be a lifeline for Ambala, Yamuna Nagar and Kurukshetra. The canal would provide 590 cusecs of water. It would be constructed at a cost of Rs 267 crore. Mr Hooda said although farmers of the region had repeatedly demanded the construction of the canal, the previous government did not listen to their pleas. It kept misleading the people on power and water issues, he said. The Congress incorporated the issue in its manifesto and work on the 374-km-long canal would start now, Mr Hooda said. The canal will cover 223 villages and the catchment area will be 52502 hectares. He said permission was being sought from the Planning Commission, following which NABARD would extend assistance for construction of the canal. Mr Hooda said the construction was being started with resources available with the government. Haryana Irrigation Minister Capt Ajay Yadav said the canal would pass through Ambala and Barara in Ambala district, Chachrauli, Jagadhari and Radaur in Yamuna Nagar district and Shahbad and Thanesar in Kurukshetra district. Captain Yadav said on the demand made by Naggal MLA Nirmal Singh, the canal would be extended to the Naggal area in Ambala. The canal would help replenish ground water and recharge the water table. Mr Bansal demanded that NOC should be promptly brought to an end. He said there was no provision for the NOC in the Municipal Act. The NOC was leading to administrative interference, he said. "While Rai Market and Randhawa Market are free hold, 5 feet of land behind the market is not. Most of the land is in the possession of shopkeepers who are ready to pay for the land but some officials are reluctant to do so. The land should be handed over to the shopkeepers on nominal charges," he said. Mr Bansal said the main gate of the bus stand should be towards the GT Road so that the traffic problem could be sorted out. He stated that dharamshalas should be constructed in slum areas so that poor people can hold marriages and social functions. He said the Tangri Bridge should be re-constructed and widened. The bridge is the only route for travelling to Uttar Pradesh. He asked for the Civil Hospital to be upgraded and its capacity raised to 100 beds. Mr Bansal said the science industry was facing a tough situation and suitable facilities, incentives and loans should be given to them. He demanded that Guru Gobind Singh Library should be constructed at the earliest. He also said various facilities should be given at the Ram Lila Ground where fairs are held. A large building should also be constructed at the ground.